How Big Is a Baby Dolphin? Dolphins can be found in nearly all of the world's oceans and seas in a variety of species. 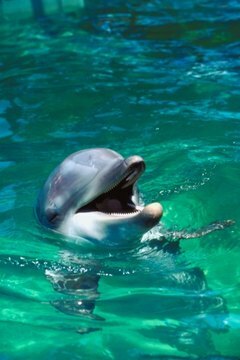 As of June 2011, there are 32 species of dolphins known to man. The size of the a baby dolphin can vary greatly depending on its species and the climate in which it is accustomed to living. For example, bottlenose dolphin calves living in cold waters are often larger than calves living in warmer climates because they require additional blubber to keep them warm. Given the many species of a dolphin, it can be difficult to generalize the size of dolphins, even at birth. For example, an adult tucuxi is the smallest of dolphins and has an average weight between 75 and 100 lbs. 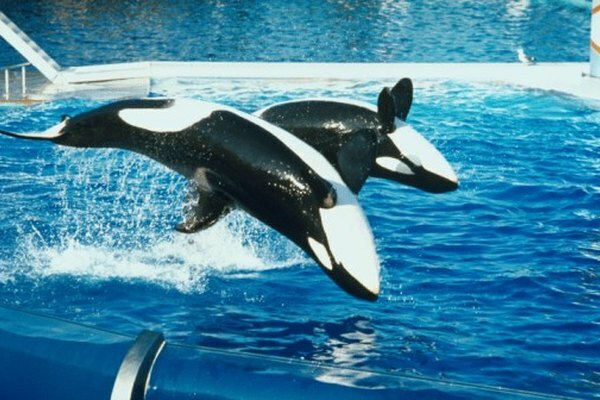 The orca, however, can reach weights upward of 12,000 lbs. The most common species of dolphin is the Atlantic bottlenose dolphin, which grows to weights of 300 to 500 lbs. Despite a long gestation period of 11 months, the number of studies on the fetal development of dolphins is limited. However, a team of biologists at Northeastern Ohio School of Medicine have compiled excellent data on the second most common species, the spotted dolphin. The research shows that, at four weeks after fertilization, the size of the dolphin is a microscopic 4 mm in length. After four months of development, the fetus grows to approximately 10 cm. Once born, a baby dolphin is generally referred to as a calf. At birth, a common bottlenose dolphin calf is typically 39 to 53 inches long. The average weight of a newborn calf can vary anywhere from 22 to 44 lbs. Typically, male dolphins are only marginally larger than female dolphins. Biologists with SeaWorld have noted that dolphin calves generally nurse from their mothers until they are approximately 18 months old. Seaworld biologists also learned that calves living in captivity begin developing their teeth around three to four months of age, at which time the calf has typically reached a length of 51 to 59 inches.